In the battle of application processor units (APU) where handling graphics stream data is becoming important, Advanced Micro Devices (AMD) launches quite an impressive APU (basically multicore x86 processor with the graphic processors) named Kaveri, (named after south India's river), which looks to overflow in performance over the Intel's application processor family of same price-range in the gaming desktop market. The graphic rich gaming software running on PCs requires better graphics processing performance than the traditional data processing. When this AMD's Kaveri is compared to any near priced application processor units from Intel, most of the reports claim Kaveri outperforming Intel's APU chips. AMD's Kaveri integrates 2.4 billion transistors, quite a high compared to most of the Intel's Haswell based application processors where the average count is 1.4 billion transistors. If you look at the importance of graphic processing, the amount of graphics and multimedia data is growing in multiple dimensions. AMD has edge over Intel in delivering processor with high-performance graphic capability. AMD is serving graphic intensive gaming world at the begin of this year 2014 with this Kaveri A-Series Accelerated Processing Units (APUs), with AMD Radeon R7 graphics to offer impressive graphic performance. Kaveri A-Series has 4 CPU and 8 GPU with Heterogeneous System Architecture (HSA), which connect CPU and GPU seamlessly. HSA analyses the processing task based on the content type and passes them to right processor so that both CPU and GPU works seamlessly. The advantages of HSA includes applications can create data structure in a single unified address space, sharing data between competing elements is made easier, multiple processing task can utilise the same memory region. AMD says when it has compared HSA with openCL in the application of face recognition, HSA could outdo in performance compared to openCL by 2.3 X at a reduced power consumption of 2.4 X less than openCL. HSA is a foundation supported by another two leading processor IP vendors ARM and Imagination. Another important differentiator in Kaveri is graphics API called Mantle, a software component supporting Graphics Core Next (GCN) architecture used in the graphic processing units of Kaveri. Support for 32-channel surround audio and support for UltraHD (4K) resolutions and new video post processing enhancements and FM2+ socket compatibility for a unifying infrastructure that works with APUs and CPUs. The AMD A-Series APU processor-in-a-box (PIBs) for the AMD A10-7850K and AMD A10-7700K, which started shipping in Q4 2013, are available starting now. 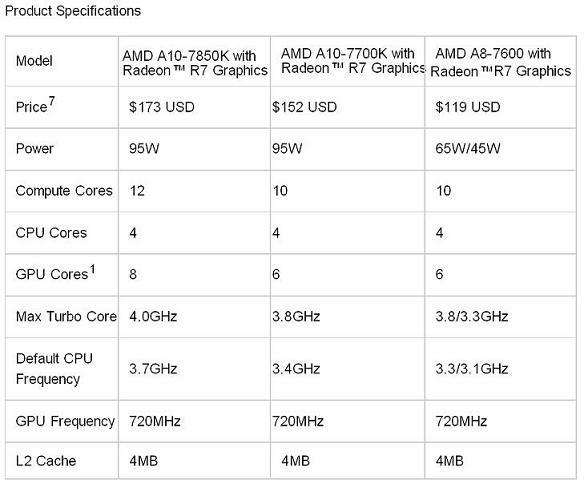 The AMD A8-7600 are expected to be shipped in Q1 2014. Intel has a lead over AMD in the chip manufacturing process technology, where Intel uses 22 nm finFET, whereas AMD uses 28 nm process technology of Globalfoundries. Some of the graphics integrated Intel's APUs perform better than this new Kaveri from AMD, but they cost higher than Kaveri.